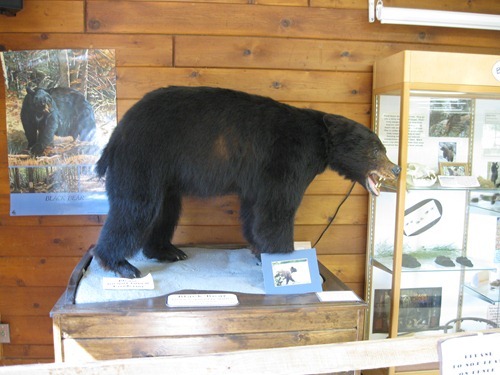 I had to laugh when BB came up with “bear” as something to find, but I put it down anyway. This park is pretty tame but you occasionally hear stories of bears in the area, so you never know! These were taken post-hunt, when we had collected some of the items. I told BB we could take pictures of anything too big or too far away to collect. 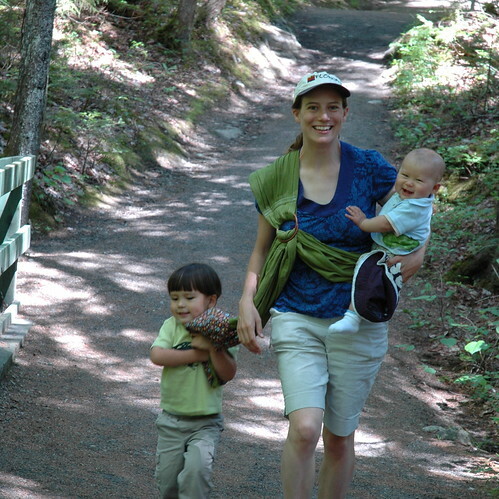 So we packed up our booklet and headed to our local park to go for a little hike. It was an absolutely beautiful day! 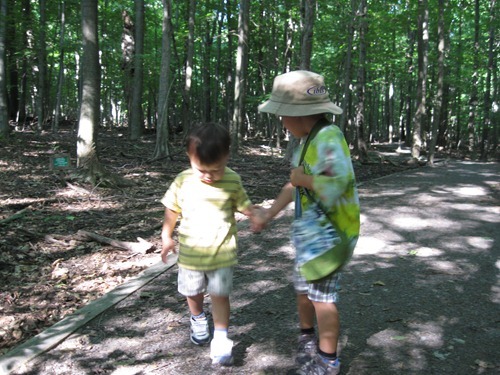 It was dim enough in the forest that pictures were blurry but BB wanted to hold LB’s hand and it was so cute. Mostly I think he wanted to boss him around, though, it’s not out of brotherly love or anything like that. They boys did a great job walking the 1 mile loop. We stopped on the playground for a bit but mostly did some walking and exploring in the woods. 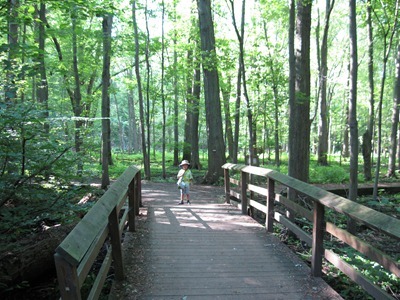 This park has a nice boardwalk over some wetlands, so we love to see what wildlife we find there. 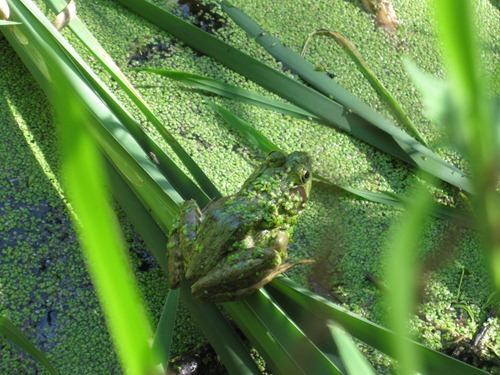 Sure enough, we found one of our items: a frog! So in the end we found a bear but not an oak leaf, go figure! (For those of you with eagle eyes, yes we found something BB called an acorn but I just let him think that, I’m pretty sure it was not because (1) it didn’t look much like an acorn and (2) we never found an oak tree). It was an activity that made a trip to the local park much more interesting so I’m sure we will be doing that again whenever we have a beautiful day with no plans! Prompted by The Artful Parent’s great list, I thought I would put together a list of things I’d like to accomplish this summer. Somehow, committing them to “paper” makes them more likely to actually get done! BB has been out of school for just over a week and already I feel like I’m falling behind. (Isn’t that so typical, to see all these great ideas and totally fail to live up to that standard?) I read this idea of having a daily schedule, which I thought was so great and immediately made one for us. Well, tell it to LB that he is supposed to nap at 1:00 pm. Ha! He has his own ideas and I have already more or less scrapped the whole idea because he remains frustratingly unpredictable in his sleep habits. I was going to “lesson plan” our weeks so that BB could do something mildly educational or vaguely enriching but so far the best I have managed is using Common Sense Media to choose the least bad TV shows on Netflix. So here goes nothing, a list of things that I will make a real effort to do this summer, both for me and with the boys, so our summer does not slip away unintentionally. Make a real garment, not a muslin, for each of the patterns I bought a few weeks ago when they were crazy cheap on sale. I especially want to try some variations on Simplicity 2599, like this one on presserfoot. Make some rompers/overalls for LB. It only took me a year to realize that this is the way to keep him from sticking his hand in his diaper. Eureka! Carve at least one new rubber stamp. Grow a bean pole teepee. We have already started on this and I’m hopeful it will work out. Transition BB to a bike with training wheels… he is getting too big for a tricycle, although he loves it! Go swimming with the boys. 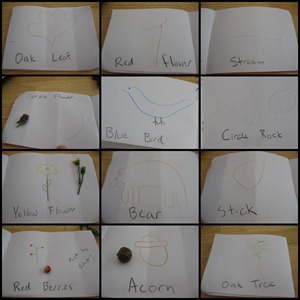 Do a nature scavenger hunt. Try to find a few more letterboxes. We found our first one the other day and it was fun! Go camping! It’s been 2 years since we last tried it, but once upon a time we were big into camping, maybe this year we can swing it! Try our very best to do an index card a day, inspired by daisy yellow. We have started on this but been inconsistent. I figured this is something BB and I can do while LB naps; it’s a nice way for him to focus on fine motor skills. He has been doing really well making smaller designs and really enjoying the project. I got him his own watercolors and oil pastels so we can experiment with lots of different media. Make some pie plate scarecrows for the garden, a craft I saw in a children’s gardening book. Continue with some “real” art lessons, color theory, line, shape, texture… a basic look at some things that were presented on pineapple paintbrush not that long ago. BB was not that into it, a little too advanced for him, but he’s older every day, so we’ll try some more this summer. Have a playdate once a week at least (I am terrible about this) so the kids see someone besides me. Go to the science museum. Take BB to the art museum after looking at some books of famous painters. Put together at least a few of the activities on the various montessori blogs I follow; they are so full of good ideas and I never do any of them! Am I the only one whose kids would rather run in circles screaming like banshees than tweeze pom-poms into an ice cube tray? Well, I am going to try again to get them interested in these motor skills/language/math activities. Make ice cream and popsicles. That’s educational, right? Cultural? Hmmm, well, it’s something we’ll do for sure, at any rate. And a final goal for me is to go to bed earlier so I’m not so tired! Which means less of this and more ZZZZZZZZZzzzzzzzzzzZZZZZZZZZ! So here’s a quick look at a recent project now that I have my camera back (yay! 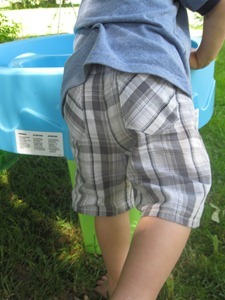 ), a pair of shorts I made for LB (a mere days before I decided he should spend all summer in overalls). I went to a garage sale up the street and bought a hideous pink chair with the goal of learning to reupholster and/or make a slipcover, both incredibly practical things I don’t know how to do. I was looking at some women’s shirts and the lady threw them in with the chair, so hey, free shorts! I used the sleeves, which was great, men’s shirts always have cuffs but this shirt, being a women’s shirt and unfettered by such rules, did not. I cut two legs (remembering to make a right AND a left, not two lefts like in my most recent pants project), sewed them up at the crotch, decided to add pockets, put in an elastic waist and voila! Shorts! Without the pockets it would take less than half an hour but those were a little time consuming. They really make the shorts look a lot nicer though so it was time well spent. I am currently (slooowwwwlllyy) trying to eke out a pair for BB of the remaining fabric, which is full of darts and whatnot that lazy me didn’t pick out. Happy summer to all 2 of you that read this!